I reflected on the subject of my spare-time literary activities. One beginning and one ending for a book was a thing I did not agree with. A good book may have three openings entirely dissimilar and inter-related only in the prescience of the author, or for that matter one hundred times as many endings. It’s hard to resist the temptation to mimic that opening in writing anything about Flann O’Brien in my own spare-time literary activities; to have several beginnings, and any amount of endings. To start with: I have a particular place in my heart for the work of Flann O’Brien. Everyone in Ireland, give or take, knows that his real name is Brian Ó Nualláin, or Brian O’Nolan in English. Except that that’s not entirely true. The family surname, although it was always Ó Nualláin in Irish, was originally Nolan in English, not O’Nolan, the O’ being attached in the aftermath of the Gaelic League’s pushing for a revival of Irish language and culture in the 1890s. So even from an early age Flann was used to a certain mutability, a certain slipperiness, in his external identity. He would later write as Myles na Gopaleen, a name looted from Dion Boucicault’s 1860 play The Colleen Bawn, and also from Gerald Griffin’s The Collegians, but he also wrote as Brother Barnabas, Lir O’Connor, George Knowall, and many more names as well, some of which are known, but with yet more undoubtedly still waiting to be discovered. What we do know—or at least think we know—is that, except for some very early newspaper work in the Irish language, it seems that he never wrote under any of the variations of his own name. Flann O’Brien’s first novel, At Swim-Two-Birds, published by Longman, Green & Co. in March 1939, attracted praise from the likes of Graham Greene, who was working as a reader for Longman’s, and later from a self-exiled James Joyce in Paris, just two years before his death. At the age of twenty-seven O’Brien’s star seemed to be on the ascendant, and he assured all his friends in Dublin that his next work, the as-yet unnamed and unpublished The Third Policeman, was better. However it was rejected with the note, ‘We realise the author’s ability but think that he should become less fantastic and in this new novel he is more so.’ His agents tried a few other publishers, but nobody was biting. He covered this up by telling his friends that it was no longer in his possession, misplaced variously by stupidity, loss, or misadventure: he had left it behind in the Dolphin Hotel on Essex Street; it was lost on a train; it had blown away, a page at a time, out of the boot of his car whilst driving through Donegal. The truth was, however, more prosaic: the manuscript sat in a drawer in one home or another for over a quarter of a century, until it finally saw print after his death, and secured his legacy forever. To add to his troubles, Longman’s premises were destroyed during a London bombing raid by the Luftwaffe, destroying all unsold copies of At Swim-Two-Birds. A potentially glittering literary career that at the beginning of 1939 had seemed unstoppable had less than two years later been ground to a halt. O’Brien had not stopped writing, however: he began his Cruiskeen Lawn column in the Irish Times on 4th October 1940, originally as An Broc (The Badger), but from the second column on as Myles na gCopaleen, a name further tweaked to Myles na Gopaleen in the 1950s, under which name it ran until his death in 1966. He also published a short novel in Irish, An Béal Bocht, under the name of Myles, and had a play, Faustus Kelly, performed in the Abbey Theatre in 1943, but it would not be until 1961 that he would have another novel published in English, when MacGibbon and Kee published The Hard Life, followed by The Dalkey Archive in 1964, for which O’Brien cannibalised parts of The Third Policeman. The Cardinal and the Corpse, a 40-minute semi-documentary made in 1992 by Christopher Petit and Iain Sinclair for a late-night slot on Channel 4, described quite accurately by one commentator as ‘a show about books and bibliophiles in London,’ muddied the pseudonymous O’Brien waters further. When I first watched it, I had no idea what was going on in The Cardinal and the Corpse, or who most of the people in it—with the exception of Alan Moore and British science fiction writer Michael Moorcock—were. It seemed to be another story with several beginnings, several different threads running through it, none of which I had the slightest understanding of. Had Flann O’Brien written these? If so, why hadn’t I heard of them before? There was a lot I hadn’t heard of, I was finding, and Drif had specifically said that they weren’t in the bibliography. I did the only thing I could: I went looking on the internet, back then in 2009. A search for ‘Sexton Blake / The Cardinal and the Corpse’ returned nothing, leading me to believe that they’d made the whole thing up, and that should have been that. But for some reason it wasn’t. I looked at the thing a few more times, and did a few more searches. Time marched on, and more and more information found its way onto the internet in the meantime. When I finally had enough sense to do a targeted search for just ‘The Cardinal and the Corpse,’ I got a result. There had been a book called The Cardinal and the Corpse, and the author was given as Stephen Blakesley, just as they’d said. Perhaps there was something to it, after all. 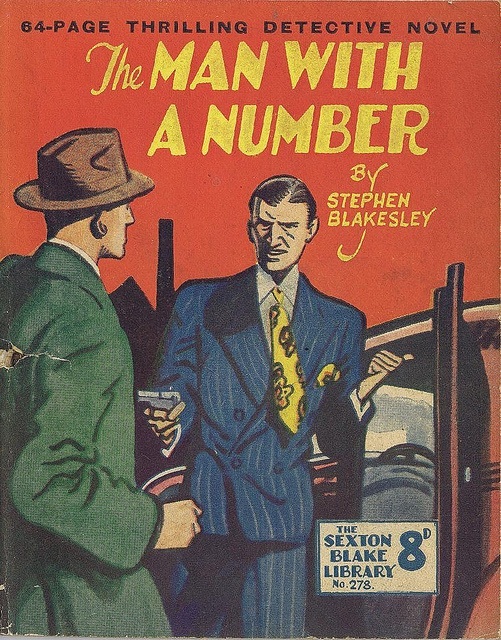 To cut a long story of late-night Googling mercifully short, I figured out that an author called Stephen Blakesley had produced eight titles, between 1946 and 1952. Some of these were actually Sexton Blake titles, too. So at least some of what was in Sinclair & Petit’s TV programme was true, after all. Sexton Blake was a fictional detective who lived in Baker Street, as did Sherlock Holmes, and while in December 1893 The Strand Magazine was publishing Sir Arthur Conan Doyle’s The Final Problem—in which Holmes apparently fell to his death at the Reichenbach Falls—issue six of The Half-penny Marvel published The Missing Millionaire by Hal Meredeth, the very first appearance of Blake, the same month. Sexton Blake worked as a consulting detective, had a sidekick called Tinker, a faithful hound called Pedro, and a bullet-proof Rolls-Royce, named The Grey Panther. He was a bit more of a physical detective than a cerebral one, though, and this may have been part of his appeal to his intended Penny Dreadful audience. Before long there were Sexton Blake stories—either stand-alone stories or serialised ones—appearing in The Half-penny Marvel, The Union Jack, and Pluck, and numerous others. Blake was hugely popular, and there have been something in the region of 4,500 stories written about him, by around two hundred writers, an awful lot of them under various pseudonyms and generic house names. It is a pity you did not like my beautiful book. As a genius, I do not expect to be readily understood but you may be surprised to know that my book is a definite milestone in literature, completely revolutionises the English novel and puts the shallow pedestrian English writers in their place. Of course I know you are prejudiced against me on account of the IRA bombings. To be serious, I can’t quite understand your attitude to stuff like this. It is not a pale-faced sincere attempt to hold the mirror up and has nothing in the world to do with James Joyce. It is supposed to be a lot of belching, thumb-nosing and belly-laughing and I honestly believe that it is funny in parts. It is also by way of being a sneer at all the slush which has been unloaded from this country on the credulous English although they, it is true, manufacture enough of their own odious slush to make the import unnecessary. I don’t think your dictum about ‘making your meaning clear’ would be upheld in any court of law. You’ll look a long time for clear meaning in the Marx Brothers or even Karl Marx. In a key I am preparing in collaboration with Mr Kevin O’Connor, it is explained that the reader should begin on p. 145 and then start at the beginning when he reaches the end like an up-&-down straight in Poker. The fantastic title (which has brought a lot of fatuous inquiries to bird-fanciers) is explained on p. 95 and is largely the idea of my staid old-world publishers. My own title was ‘Sweeny in the Trees’. I am negotiating at present for a contract to write 6 Sexton Blake stories (25 to 30,000 words for £25 a time) so please do not send me any more sneers at my art. Sorry, Art. Many things that would preoccupy O’Brien throughout his life are evident in that letter: his desire for literary acceptance, his preoccupation with money, his difficult relationship with James Joyce, and of course his strange obsession with Sexton Blake. O’Brien’s choice of Ethel Mannin as a possible champion of his work is certainly a strange one: her forté was mostly sentimental popular fiction with a left-leaning feminist tinge, very far from what AS2B was, and her liberal views—she had affairs with both W.B. Yeats and Bertrand Russell—hardly coincided with O’Brien’s own highly conservative Catholic worldview, or his evident misogyny. O’Brien next mentions Sexton Blake over fifteen years later, in 1955, when he writes to the Stephen Aske literary agency in London, suggesting that he would write Blake stories for them to place on his behalf. This letter arises from a chat I had the other day with my friend Marten Cumberland, who gave me leave to quote his name. He told me of the market for Sexton Blake stories and suggested I get in touch with you. I am interested in trying my hand at this sort of work. I have read the Sexton Blake stories in my day and can, of course, refresh my recollection with the current stories. I am sure I could do this job particularly as Cumberland said he thought the plot would be supplied. Anyhow, I should like to try. I would be willing to supply two chapters as a sample for nothing. Sadly, there is no record of a reply to this. PDS: I believe I’m right in saying you’ve written several Sexton Blake detective stories? PDS: Are you proud of them? FOB: I am very proud of them, very proud indeed. PDS: How many did you write? It is sad to find how a friend, intending to be kind, can bring down gloom and sorrow. A few weeks ago one of my Ladies of the Bedchamber at Santry (a purely honorary office) called to a newsagent to collect my usual compendium of reading matter, and in due time delivered to me Lady’s Home Journal, Osservatore Romano, Our Boys, Which?, Fanny Hill, Studies, Die Zeit, News of the World, and – The Last Tiger, a Sexton Blake story by Wm. A. Ballinger. It was that last item which shocked me deeply because (a) the book announced itself to be the last of the Sexton Blake series, the great detective having just retired, and (b) because I have myself belonged to the arch, arcane, and areopagitic coterie of authors who have written Sexton Blake stories for Fleetway Publications Ltd, London. Oh, do not laugh, reader. I am very proud of that achievement, and it is barely possible that the Editor might get permission to reproduce my story serially in these columns. Those four mentions of his writing Sexton Blake stories —in 1939, 1955, 1962, and 1964—are the only ones I can find—which is not to say there aren’t others yet to come to light—but in themselves they certainly show that, over that twenty-five-year span, and possibly before it, Flann O’Brien was both interested in Blake, and either had written stories for the series or, for whatever reason, kept up the pretence that he had written them, for at least a quarter of a century. Why was Flann O’Brien so obsessed with the idea of writing Sexton Blake stories, which ones might he have written, and, finally, did he actually do so? To understand the why of this conundrum, this insoluable Mylesean pancake, we need to know something of his circumstances. O’Brien is often lumped in with James Joyce and Samuel Beckett, as the third member of the trinity of modern Irish literature, but he really wasn’t like them, in many ways. Joyce and Beckett were Dubliners, born in the affluent suburbs of Rathgar and Foxrock, respectively, but Flann was an outsider, being from Strabane in the divided six counties of Northern Ireland. Whilst Flann longed to be a Dubliner, the other two turned their backs on their native city—and country—settling in mainland Europe. Any chance he might have had to migrate, to become a true European ex-pat, was destroyed by World War II, his failure to find a publisher for his second book, and his role as the family’s sole earner after his father’s death in 1937. He was bound to the life of a civil servant, tethered to his own perception of himself as a failed novelist. One other thing, both cause and effect, feeding back on itself, was his voracious alcoholism, which took hold of him early, and undoubtedly contributed hugely to his too-early death at the age of fifty-four, just when it seemed he might actually be making some sort of a comeback as a proper writer. As a result of several of these things, O’Brien was always looking for more ways to make money, and the Sexton Blake stories seemed perfectly suited for this. They were hugely popular, and the rights were owned by the publisher, rather than the original writer, meaning that there was a huge potential market there, if he could but get his foot in the door. It also seems likely that he had read the stories in his youth. If he based various names he used on Griffin’s The Collegians, then it is also likely that he chose the name of Sergeant Pluck, the man who first utters the line ‘Is it about a bicycle?’, from the old Penny Dreadful title Pluck. And his very fascination with The Collegians does seem to show an interest in crime fiction, as does the fact that there is a volume of Sherlock Holmes short stories amongst the books in his library, as preserved in Boston College’s John J. Burns Library. But there might have been an even more fundamental reason that Flann wanted to write crime fiction, besides the need for money and the seemingly easy Sexton Blake market he was so taken with. When O’Brien’s father died they found amongst his papers a crime novel he had written, and which had been accepted by publishers Collins, but which never saw print, as the elder Nolan was unhappy about their payment terms. The incentive to write crime novels didn’t stop there, either, as Flann’s brother Ciarán had two books published by An Gúm, featuring an amateur detective, Parthalán Mac Mórna. Flann’s own crime novel, The Third Policeman, had failed to be accepted in the gap between the publication of his brother’s two books, and this may have added a certain spur to his desire to produce something in that genre. 1. He did write Blake stories—but they were all rewritten by a regular writer. 2. He was the man who wrote stories by ‘Stephen Blakesley’— in the current series, the name of the author being given as F. Bond—but of whom no details are known. 3. He certainly has never written any Blake stories under the editorship of W. Howard Baker, for Mr. Baker knows all his authors personally. 4. Being a true Irishman it is possible that the mention of writing Blakes is real Blarney! In twenty-five years I have written 10 books (that is, substantial opera) under four quite irreconcilable pen-names and on subjects absolutely unrelated. Five of those books could be described as works of imagination, one of world social comment, two on scientific subjects, one of literary exploration and conjecture, one in Irish and one a play (which was produced by the Abbey Theatre). On top of that I have produced an enormous mass of miscellaneous material consisting of short stories, scripts for radio and TV, contributions to newspapers and magazines, and even book reviews. This is work and can be very rewarding financially, often surprisingly so. But is it insufferably hard work? Not necessarily. No author should write under his own name nor under one permanent pen-name; a male writer should include in his impostures a female pen-name, and possibly vice versa. A literary agent (there are probably 50 firms in London alone) is essential for the financial realisation of a writer’s worth, particularly for the dissemination of his works abroad in translation, but the practitioner of the literary craft who is crafty will have several agents unknown to each other, each dealing with him under a particular pen-name which is not disclosed to the agent to be a pen-name. So far as Sexton Blake is concerned, I cannot help you very much, as it is such a long time ago. I should point out that in innumerable writings on a great diversity of planes—and subjects, I have never once used my own name. I have countless pseudonyms, and for reasons of my own it is sometimes necessary for me to mislead publishers. We can at least say that neither Stephen Blakesley nor F. Bond are necessarily impediments to these books being by Flann. Can those names yield any further clues, though? Flann was occasionally given to leaving little hints embedded in his pseudonyms, as we saw with his use of names from Griffin’s The Collegians. The Irish for Dublin is Baile Átha Cliath (pronounced Blaw-KLEE-ah), very similar to Blakeley, so not a million miles from Blakesley. Is that a hint, for those who wish to see it? Surely there has to be something in the similarity between that surname and that of Sexton Blake himself, too. And his other name here: F. Bond. Could it be possible that the middle three letters, BON, stand for Brian Ó Nualláin? Probably not—but you just never know, do you? If you are conducting a criminal enquiry, at least the ones you read about in books, you look for means, motive, and opportunity. And you look for evidence, which will allow you to tie all these together. Flann O’Brien certainly has plenty of motive to want to write, and to write Sexton Blake stories in particular. He had the means, as he was an accomplished writer, by any measure you care to use. Did he, though, have the opportunity? Did the editors at the SBL ever accept or publish any of his work? At the outset, there seems to be plenty of evidence to suggest that he did. There are a huge amount of references to his having written Sexton Blake books, sometimes even including the possibility of them being under the name of Blakesley, in books and articles, and online blogs. Nonetheless, nobody seemed really sure. There were, after all, a few snags, the most serious of which is the time-frame of it all. If, as he told Ethel Mannin in 1939, he was negotiating with the SBL to write books, why was he writing to ask Stephen Aske to place stories for him in 1955? If he didn’t start writing the stories before 1955, then what about all the books published under the name of Stephen Blakesley between 1946 and 1952? It did seem as if the mystery would remain unresolved, without even a satisfactory explanation as to why the story was so prevalent, yet so untested. Even the National Library in Dublin have three SBL Blakesley titles attributed to Flann O’Brien listed in their catalogue. Thus far, therefore, the story of the mysteries of Flann O’Brien. Perhaps O’Nolan wrote them, or perhaps he wrote other, earlier ones. […] Pity the poor bibliographer. All helpful correspondence will be gratefully received. Sir, – The problem of whether or not Brian O’Nolan (Flann O’Brien) wrote Sexton Blake stories—mentioned by Denis Donoghue in his review of Anthony Cronin’s biography of O’Brien, No Laughing Matter (October 27– November 2) —has bedevilled researchers for nearly thirty years. I think it’s possible he did. What I’m sure he didn’t do is write them, or anything, under the name ‘Stephen Blakesley’—although I fear the canard that he did may well, in the first place, have emanated from me. In 1962 a colleague of mine, Bill Lofts, wrote to O’Nolan, who proved evasive on exactly which Blake novels (out of fifteen hundred) he’d written, when, and under what pseudonym; follow up letters were ignored. All of the Blake authors had by then been identified, their pseudonyms penetrated—except for one writer: Stephen Blakesley, who wrote a handful in the period 1951-3 (The Riddle of the Blazing Bungalow, The Trail of Rider No. 1, etc). No trace of him has ever been found, no Blake writer remembered ever seeing him and, in any case, payments for the books themselves were discovered to have been made to an ‘F. Bond,’ which might have been the real name of the author, or an agent or—as it was then (1962) suspected—a cover for Brian O’Nolan. In the late 1970s I discovered that cheap paperback originals (non-Blake) by ‘Blakesley’ had also been published in the period 1945-7 (Terrell in Trouble, The Cardinal and the Corpse, etc). I mentioned the Flann O’Brien /‘Stephen Blakesley’ theory to a friend, who then passed on the good news to a runner for a number of London Modern-Firsts dealers. Within a couple of months no Blakesleys were to be found anywhere, unless you had a tenner or more to spare—and this at a time when the average early-1950s Sexton Blake usually sold for 25p. The snag is, the Blakesley books simply don’t read like Brian O’Nolan. That is to say, they don’t read like a witty and clever writer hiding his true style under a veneer of junk, or even a man verging on alcoholism (as O’Nolan was at that time) banging out the first thing that came into his head, for money. There are no little touches, no penetrable (to those in the know) jokes. They are distinctly run-of-the-mill. Significantly, the main characters in most of the Blakesley thrillers (Blake or non-Blake) have a habit of settling their differences in a particular area of Britain—the industrial Midlands, where I suspect ‘Stephen Blakesley,’ whoever he was, came from originally. In any case, ‘Blakesley’ only wrote three Sexton Blakes, not five. I’m not sure if the quibbles about the quantities of SBL books Flann claims to have written are important, but one sentence immediately jumped out at me: ‘I mentioned the Flann O’Brien/‘Stephen Blakesley’ theory to a friend, who then passed on the good news to a runner for a number of London Modern-Firsts dealers…’ As far as I’m concerned, there’s only one person who fits this description: it had to be Driffield, from The Cardinal and the Corpse. Was the entire thing, from beginning to end, a scam by a canny bookseller, to sell largely worthless books for vastly inflated prices, based on some very dubious circumstantial evidence? Did anyone know the truth? One day, not too long ago, I spotted Micheál Ó Nualláin, the only surviving member of the twelve siblings, and eighty-six years old himself, waiting for a bus out to Monkstown. I should go and ask him, I thought. But did I want to? Did I want to actually solve this, to know for sure if it was true or untrue? I’d already done a ridiculous amount of digging, involving visits to both the National Library here in Dublin and the British Library in London, much correspondence with lots of kind and helpful people, and spent far too much money buying books that ultimately expanded, rather than diminished, the mystery here. If I asked the question, all that would be as nothing. I thought about it, and watched his bus arrive, watched him get on it, and wondered if I’d made the right decision, not approaching. And I decided that I definitely should have asked him, because I might never get another chance. None the less, research is ongoing. Pádraig Ó Méalóid is a comics historian from Dublin. He is working on a book on the history of Marvelman. His writing has appeared in The Beat & Forbidden Planet Blog. This essay on Flann O’Brien was published in gorse no. 3.